Bisphenol A, whose impact on reproduction and development is the subject of numerous studies, induces anomalies in the inner ear of embryos of certain vertebrates. This new, completely unsuspected effect has been demonstrated on zebrafish and Xenopus, a type of frog, by a French team headed by Vincent Laudet of the Institut de Genomique Fonctionnelle in collaboration with researchers from Inserm, the Museum National d'Histoire Naturelle and INRA. Published in the journal BMC Developmental Biology, these results illustrate, for the first time, the sensitivity of the inner ear in vertebrates to bisphenol A. The study demonstrates that the effects of this chemical compound on the embryonic development of animals, including mammals, now needs to be explored in greater depth. Bisphenol A (BPA) is a synthetic chemical compound widely used in the industrial manufacture of polycarbonate type plastic containers and other everyday items such as CDs, spectacles, certain plastic bottles and some baby bottles. It is also employed in epoxy resins used in the internal linings of tin and drink cans, and in dental amalgams. However, BPA can modify the hormonal balance of vertebrates by directly interacting with hormonal receptors or with the enzymes that ensure the metabolism of these hormones: it is an endocrine disruptor. In fact, BPA is capable of binding to estrogen receptors, female sexual hormones, and mimicking their action in the body. For this reason, it is now classified as a "category 3 reprotoxin", in other words, as a substance which causes concern for human fertility due to possible" (albeit not conclusively demonstrated) "toxic effects" on reproduction. Risk assessments have led to the definition of a tolerable daily intake (TDI) of 50 µg of BPA per kg body weight per day, i.e. 2.5 mg per day for a person who weighs 50 kg. Until now, most of the studies carried out to characterize and evaluate its effects on the human body have focused on the reproductive function and the development of the brain. The researchers focused on the effect of this compound on embryonic development by exposing zebrafish (Danio rerio) eggs to increasing concentrations of BPA (from 1 mg/L to 20 mg/L). 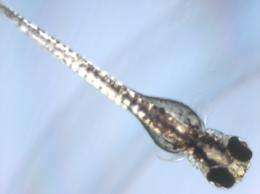 The results were surprising, to say the least: following exposure to BPA, most of the zebrafish embryos developed abnormalities of the otoliths, the small structures of the inner ear that control balance and play a role in hearing. 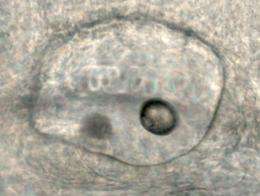 Otolith aggregates formed in 60% of the embryos. Other, less frequent abnormalities of the inner ear were also observed. Above a concentration of 15 mg/L, all of the zebrafish developed abnormalities. However, this dose corresponds to a very acute exposure, much higher than the possible range of exposure levels in humans. Going further, the scientists repeated their experiment on another vertebrate of the amphibian family, Xenopus. Once again, they observed the development of abnormalities in the inner ear, suggesting that this effect could exist in other vertebrates. The team has thus brought to light an unexpected and hitherto unobserved effect of BPA. Obviously, no conclusion can be reached for humans as long as the action mechanisms have not been completely elucidated and in-depth research has been carried out on mammals and on humans in particular. In addition, the researchers observed that these anomalies persisted even when estrogen receptors - the conventional targets of bisphenol A - were blocked, implying that BPA could attach to another receptor. This newly discovered effect could therefore be completely independent of estrogen receptors. This work clearly demonstrates that, apart from its reprotoxic effects, bisphenol A at quite high doses also has an effect on embryonic development. It also shows that this compound has more target sites than previously thought. Finally, it opens new research avenues to characterize the way in which bisphenol A functions, and to correctly evaluate its effects. The zebrafish (Danio rerio) and Xenopus sp. combine in vivo ease of use with in vitro pertinence. Both are small, robust vertebrates that are easy to breed. These organisms are therefore quite similar to humans and mice. They are good models for conducting genetic experiments on account of their rapid embryonic development.